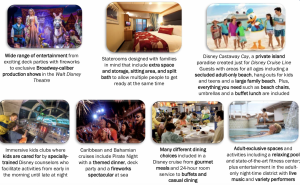 14 Apr Whats included in a Disney Cruise? From gorgeous ships, amazing shows and entertainment, to yummy food, great kids activities, and impeccable service that can’t be beat, Disney Cruise Line truly is the best! Check out this video to see some of the highlights !